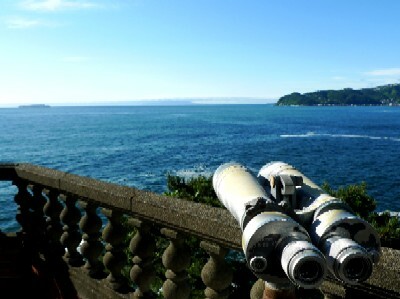 The trip to Atami was for a celebration of my best friend’s mother’s birthday. 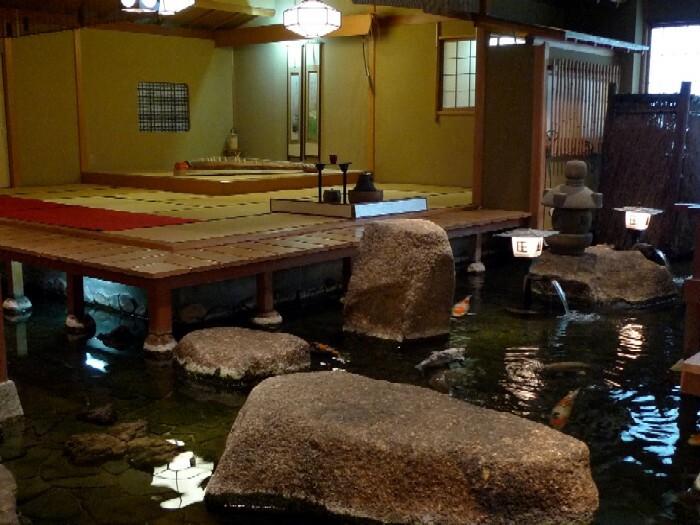 I chose a unique hotel I was interested in for years among various accommodations in the popular hot spring resort. 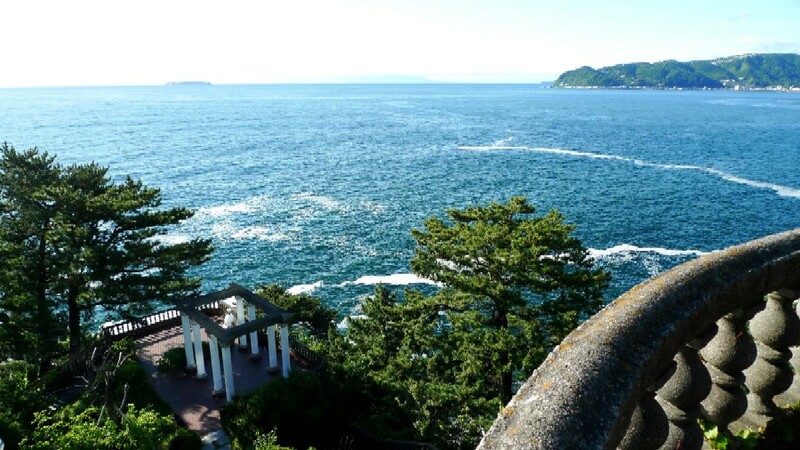 The Akao Resort is a hallmark of Atami: it consists of two hotels (Hotel New Akao and Royal wing), Herb & Rose Garden, Akao Beach Resort, and restaurants on a vast site of the heart of nature Nishikiga-Ura (a scenic bold cliff area) enclosed by the sea and the mountain. Kuranosuke Akao, the founder of the complex, who originally owned a small souvenir shop in the downtown built a small wooden inn with 12 rooms in the area in 1954. 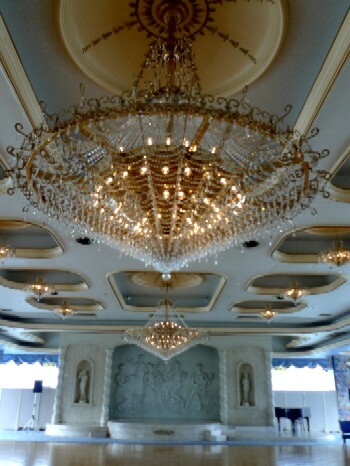 The inn was rebuilt into New Akao, the 20-story building with 127 rooms, a swimming pool, shopping arcades, restaurants, banquet halls, bathhouses, and so on in 1973. The resort was gradually expanded since then. 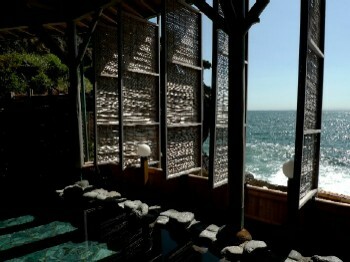 It’s built on the sea, and all rooms have the exclusive superb ocean view. This is the one from our room. 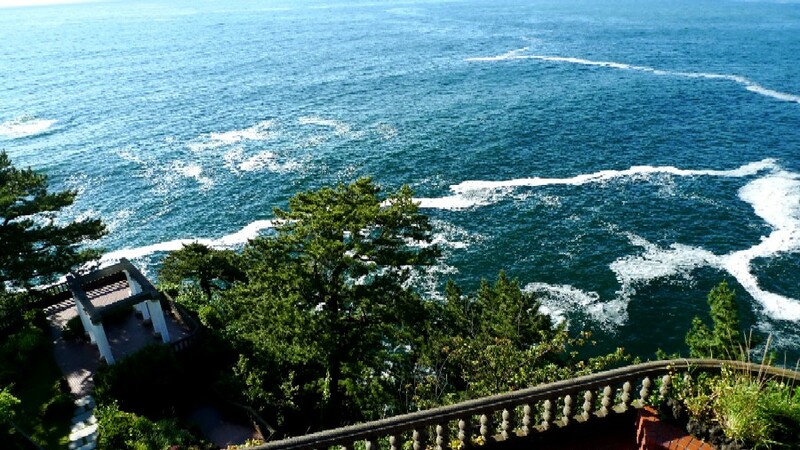 No doubt, it was one of gorgeous resort hotels in Japan during 1970s and 80s. As you can see it from the opening photo, its internal equipments tells what gorgeous was at the time. 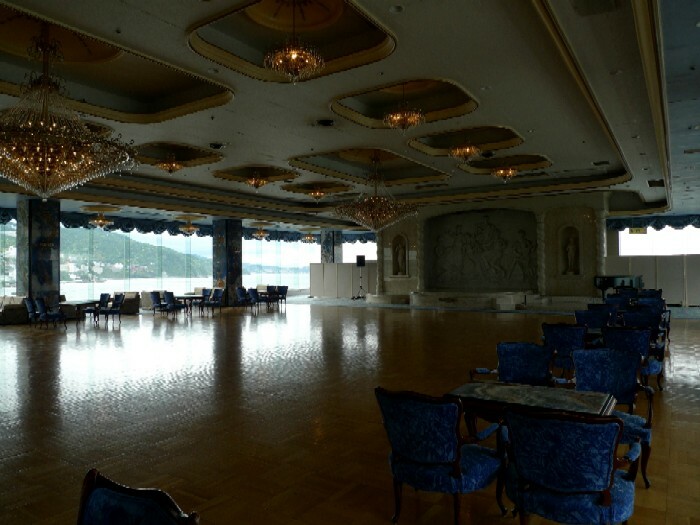 Guest can have refreshments for free from 9:00 to 17:00 in the gorgeous ballroom with a view. As may be expected of the building in 70s, the top of table was real marble. The Japanese restaurant of the hotel where we had lunch was Japanese style gorgeous. There was a tea arbor with a carp-filled pond. It has own hot springs, and guests can take hot spring baths including outdoor one, but hold up too high expectation of its quality (addition of water, cycling and chlorinated). Even so, don't have to be concerned about that there. 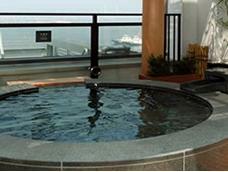 Just enjoy a bathtub with floating roses and a wonderful ocean view! 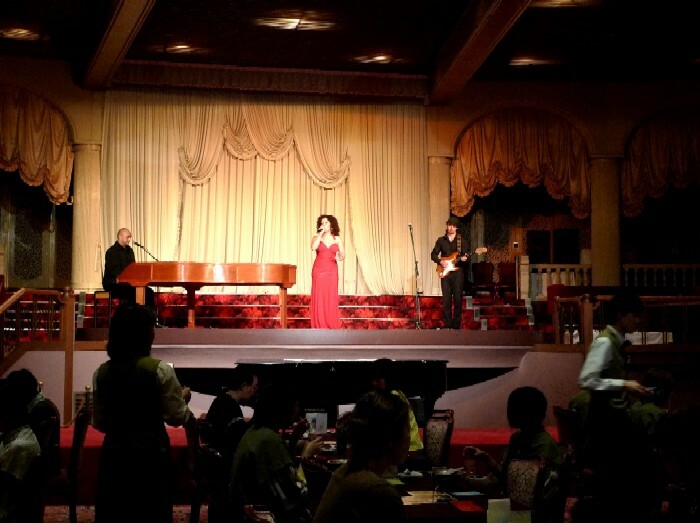 The one of their characteristic treats was a dinner show by musicians from abroad. 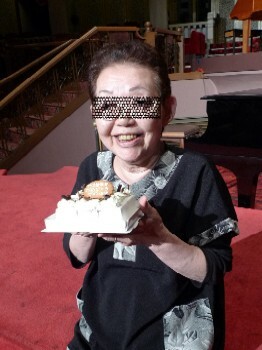 The gorgeous theater restaurant with 450 seats, Nishiki, was well worth watching. 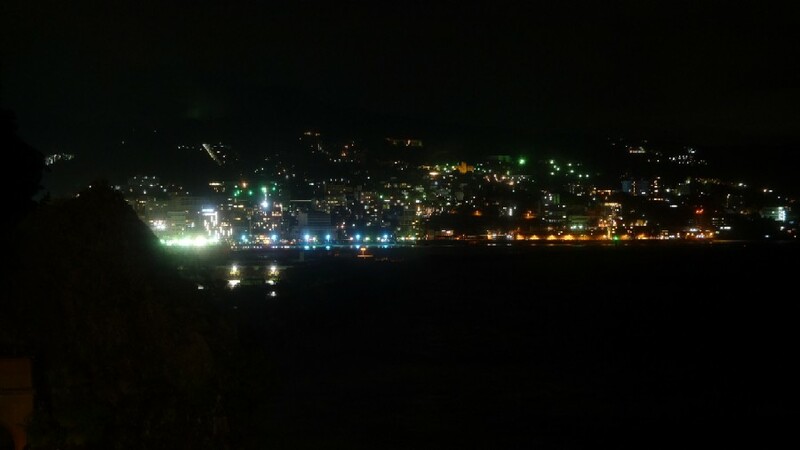 Until 30 years ago, some large hotels in Atami provided dinner shows, but I believe Akao is the only one that has kept it even though it’s small in scale. 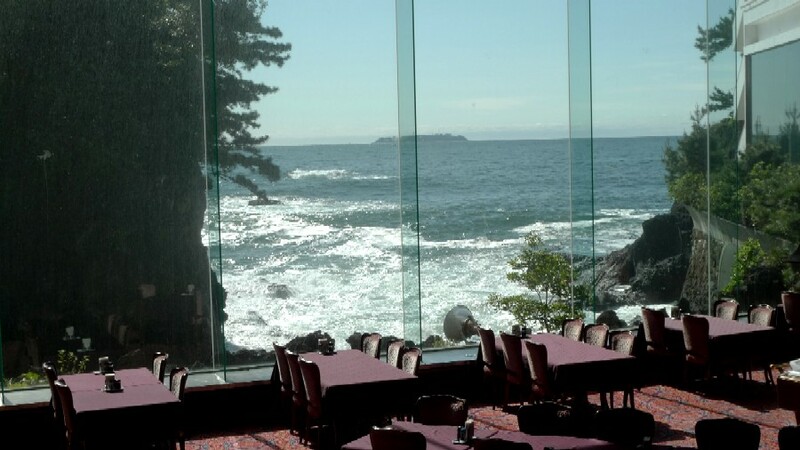 The restaurant in the 2nd floor faced a cliff and small cove, and illuminated rock surface could be seen through the window at night. 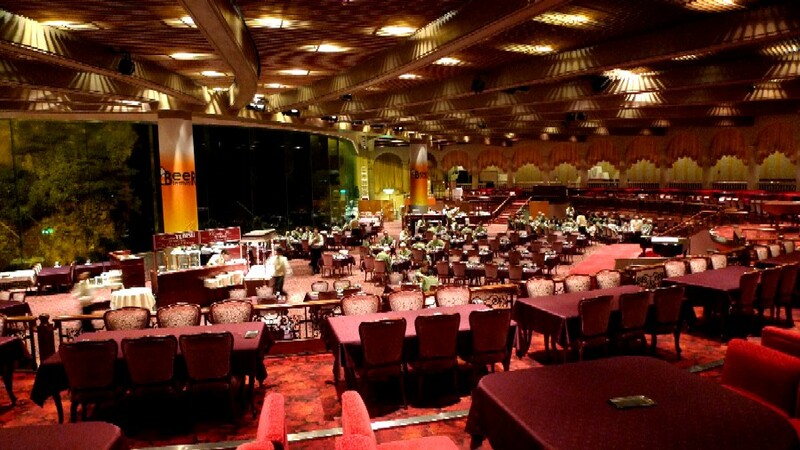 It seemed only arena tables were used, and the dinner conducted in 2 times (17:30 - and 19:30 -). The show begun in 15 minutes after sitting down to eat, so some people might feel one can’t take time eating. But, it was all right for us. My friend and I preliminarily asked the hotel to give the mother surprise presents of a birthday cake and a song from a band from New Zealand. After the dinner we stopped by a bar lounge where a free magic show was taking place. 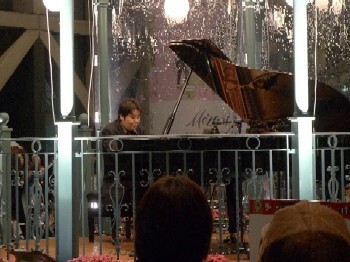 To our astonishment, the magician was the pianist of the band! He demonstrated table magic using cards, and I was surprised again at how excellent he was. I thought he was like a pro-magician rather than a musician. 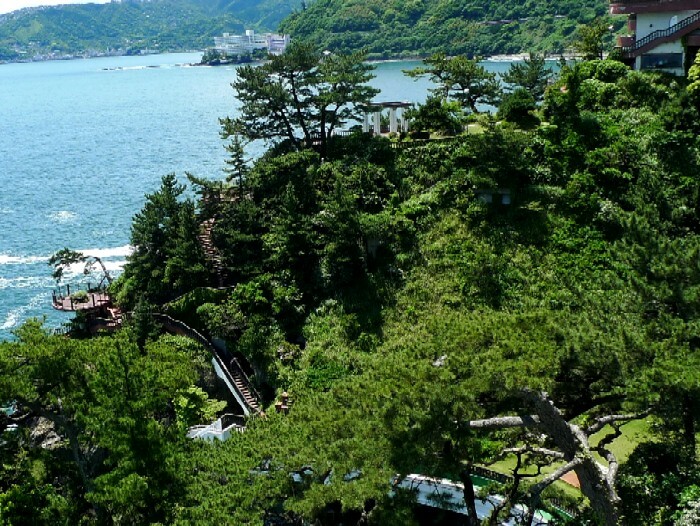 To discover the fascination of Akao Resort, you have to take a walk recreation trails that lead windingly down the side of a cliff to the low floor of the building. I took the pictures in the last but one post (the ones that appeared to be in southern France). The hotel is aimed at everyone - people of all ages and all forms of groups- and surely liked by anyone except those who expect a stylish modern resort. As you see from the pictures, that taste, Japanese- and Western-style, was translated from the most fashionable style at the time in the West by Japanese. After 4 decades, though it tries to keep the equipments and interior well kept, some of them might look a bit run-down. If stains on walls would ruin your trip, pay more money and find your perfect hotel. Still, it’s too good for the price and provides good services that contain both Japanese inn’s and Western hotel’s styles. 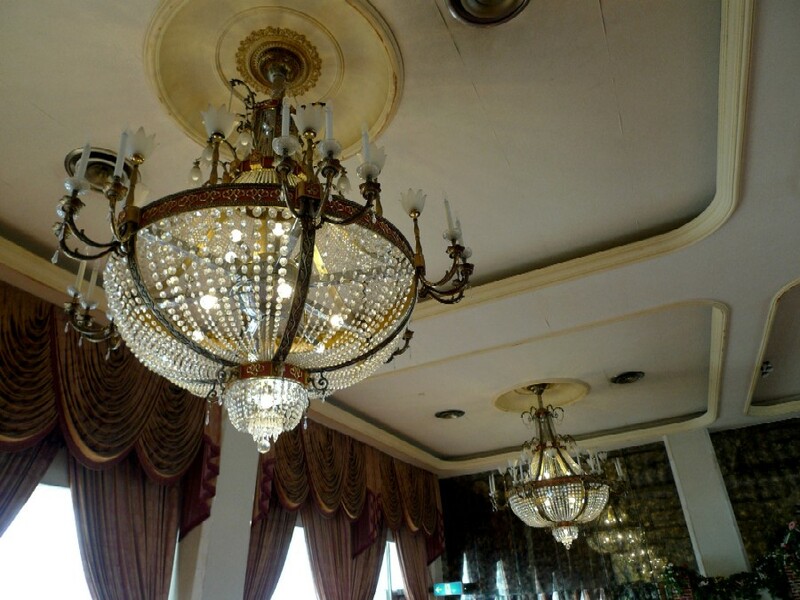 Let’s take a tolerant attitude toward the antique look and enjoy the lovely kitsch hotel and the breathtaking setting of natural beauty in it. 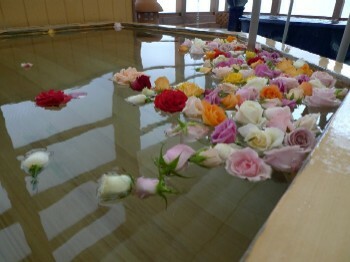 Eventually, I could get there in perfect time for enjoying roses on my third visit! 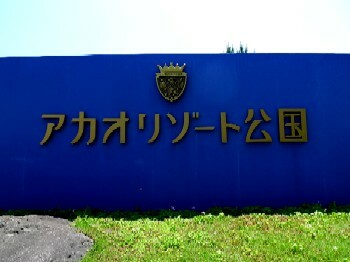 Before this visit, I went there in April and the end of Jun. 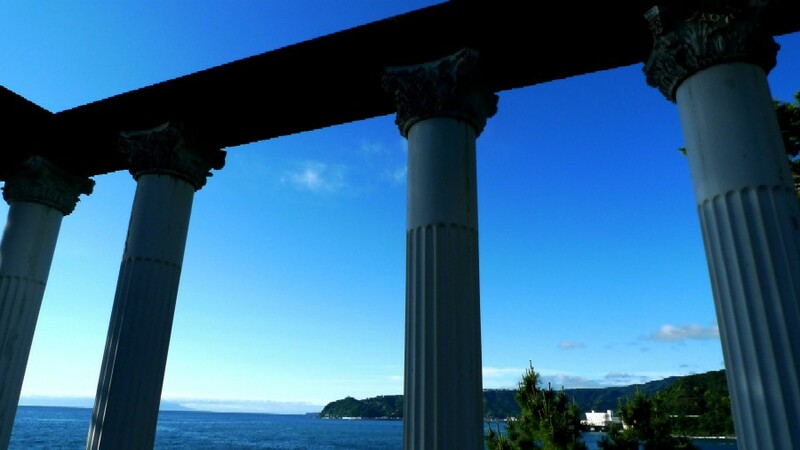 When you go to Atami, why don’t you stop by the garden for just looking at this view? 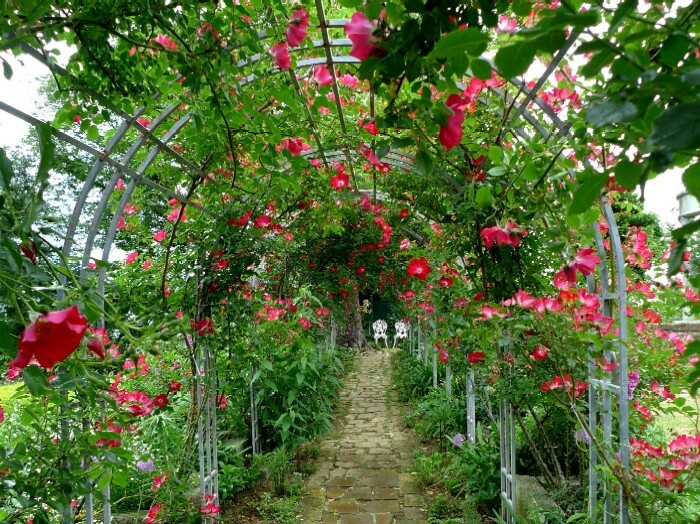 This is Akao Herb and Rose Garden (the previous post) that is one of my favorite places in Atami. 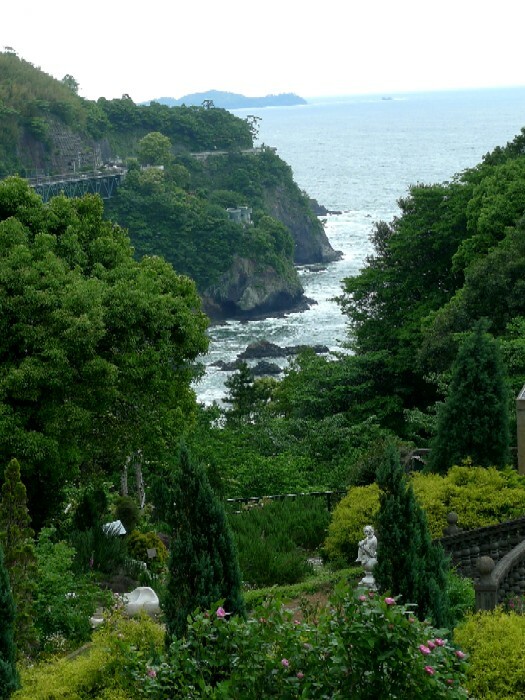 The garden is on a slope of a mountain about 2 km south of downtown Atami, and the whole site covers an area of 700,000㎡(173 acres). 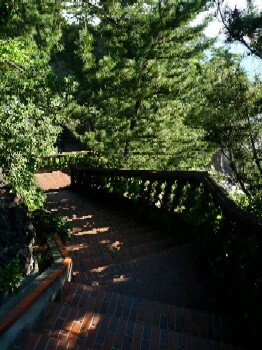 Visitors catch a shuttle bus to the top of the site and then walk down the slope while enjoying twelve different gardens. 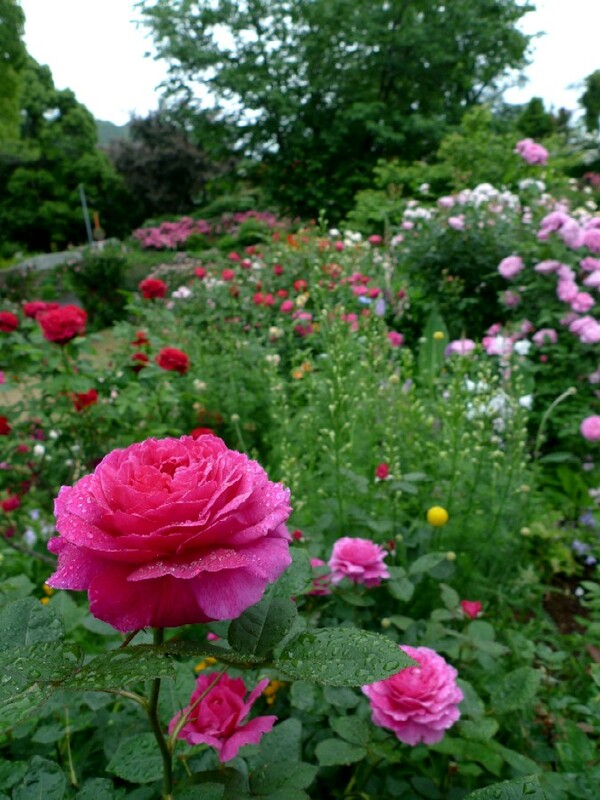 The roses in the garden will be in full bloom after this weekend, so, more precisely, the visit (last Tuesday) was little early for rose viewing. However, people say that bursting buds have a strongest scent, and thus it’s just the right time to go there when there are still the buds left. 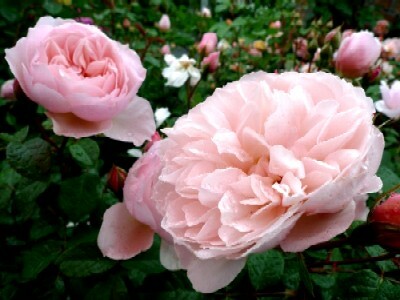 Indeed, the roses scented the air. 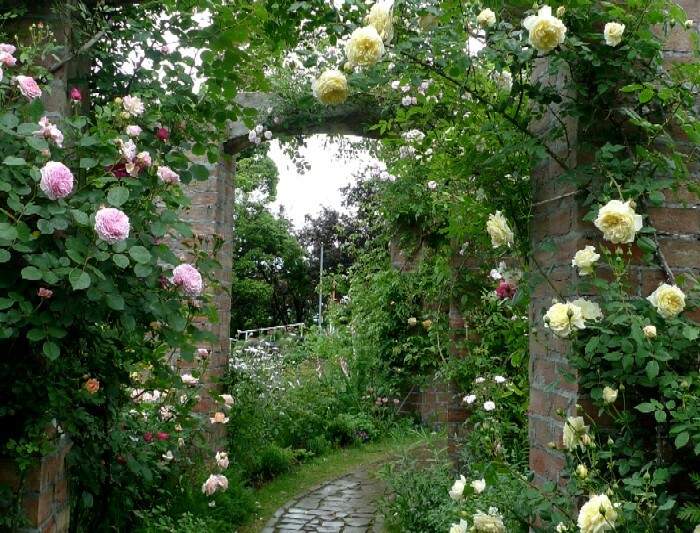 Walking through the garden with the richly-perfumed roses, I had a luxurious moment and felt comforted. 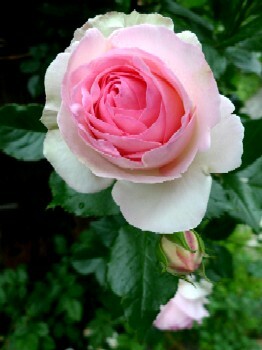 A popular flower, a rose, was of no great interest to me in my early days, but it has grown on me. Since I decided the title of the post, La Vie en Rose, I was in the mood of the song. So, I heard it sung by various singers including Édith Piaf who was the original one, Louis Armstrong, Marlene Dietrich, Yves Montand, and so on. I found the best one, sung by Cyndi Lauper, that fit my current mood. It’s awesome. She enjoys the use of her senses. If you have time, just listen! A single rose can be my garden...a single friend, my world. Un unexpected business brought me to Nice, France. I took a day off yesterday and went to Èze, not far from the city, and spent a few relaxing hours. The tourist period hasn't started yet, so the village is quiet. 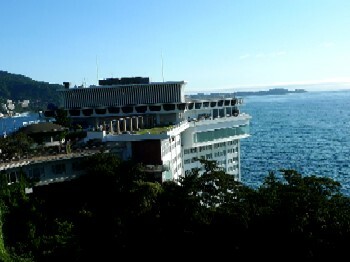 I took an overnight trip to Atami, not far from Tokyo, from Tuesday. Despite that, don’t you think the photos look like as if they were taken in Cote d'Azur? I don’t have time to write about the trip right now, so I’ll do it this weekend. Excuse me for the silly joke. On the way from an errand in Yokohama yesterday afternoon, I stopped by Shinyokohama Skate Center at which Lily Cup, a local figure skating competition in Kanagawa Prefecture, has been held. Most of the participants are students belonging to local skate clubs (the elementary school, junior high school, high school, and university), and I enjoyed performances of those fresh skaters. Two well-known skaters appeared yesterday: Akio Sasaki (22) and Fumie Suguri (31). Leave aside Sasaki (a previous post abut him), I never imagined I could watch Suguri’s performance at a competition again. Most of you have heard of the skater who leaded Japanese women’s single from the late 1990s to early 2000s with Shizuka Arakaw, but I think some of you don’t know the contributor is still in the field. I have met her strength coach once, and I had a friendly feeling for her during those years. For that reason alone, I can't stand looking at her cumulative faulty judgments and futile attempts after the Torino Olympics. If she really wanted to get in the next one in Vancouver, she should have developed her technical skill that were needed for a competition rather than focusing on “expressiveness” or being “an actress on the ice”. She was one of top skaters indeed. Her basic skating and performance are superior as compared to skaters in the competition, but unfortunately, the veteran who can only execute double jumps is far inferior to top junior skaters of the moment. I didn’t have enough protection against cold because it was an unscheduled stop, so I was cold all over. 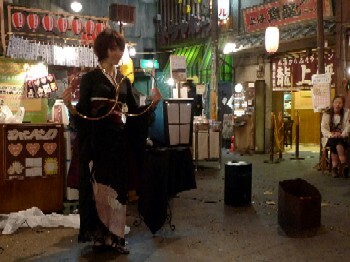 Then, after the thought-provoking performance of has-been, I went to a ramen place nearby: Shin Yokohama Raumen Museum, a food-themed amusement park established in 1994. 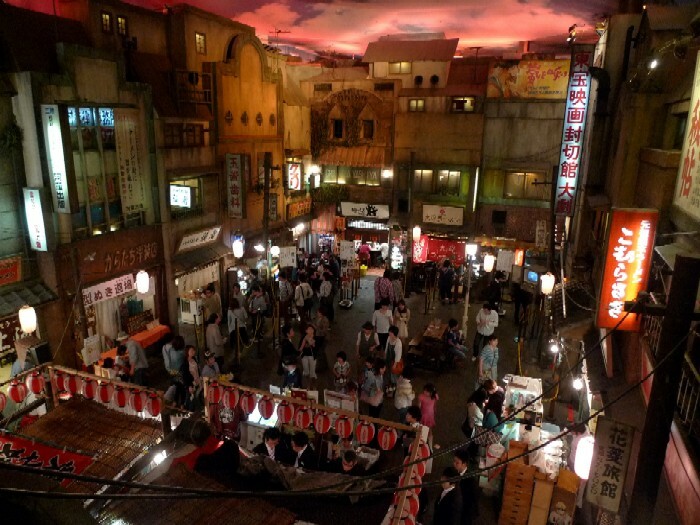 There are a ramen restaurant mall with its Showa-inspired interior design (the image of 1950s Tokyo), a souvenirs shop, and exhibitions of ramen culture and history. 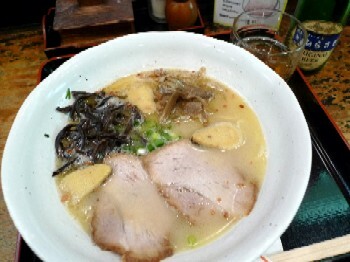 Right: I choose pork & chicken-flavored ramen, a local one in Kumamoto Prefecture. It was my first visit to the place. It's now 18 years ago since it opened. How time flies! 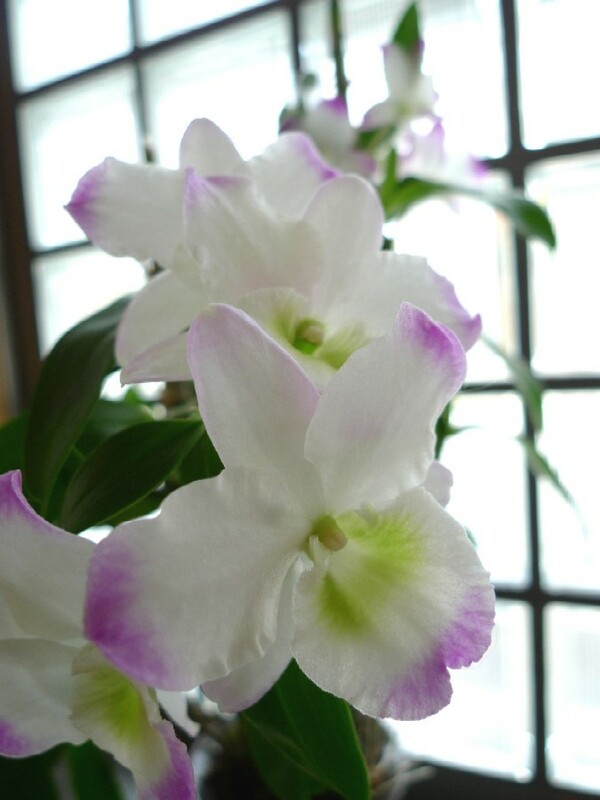 This orchid, I think it’s kind of Dendrobium, is the only plant at our house. We used to have some foliage plants, but we stopped having them because our cat bit leaves when she was a kitten. Some of them were bad for the health of cats, and scolding her was very stressful for us. 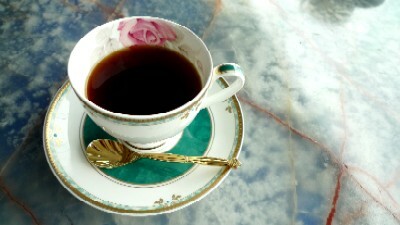 It was undesirable for me to have it: an undesirable person brought it as a token of one’s apology. I didn’t want a present, let alone something that needs to be looked after. However, the orchid was innocent, so I’ve watered it every week in the past year or so. Even though I offer minimal care, the dear little plant produces flowers! The person still bothers me, but I suddenly feel motivated to take care of it. 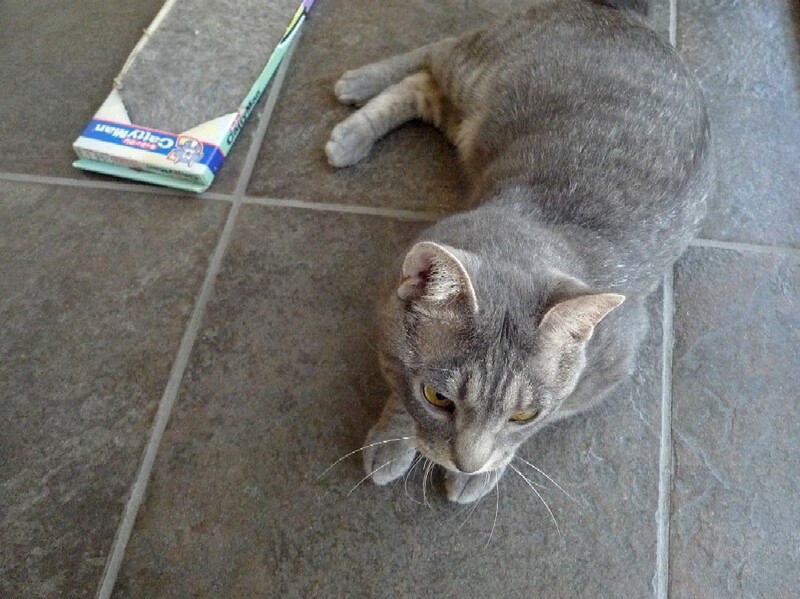 I’d like to introduce the cat, Devi (provisional name, 1 year old, male), that is a candidate for our new member of the family. He’s been staying with us as a trial since yesterday. To be honest, the point isn’t whether he can familiarize oneself with us or not, but whether our house cat, Chihuahua (7 years old, female), can handle living with him or not. I have always thought to adopt a new cat since a cat we kept with Chihuahua died at age 4, few years ago, by the cancer disease, but I didn’t feel something click inside me if I saw cats and kitties that need home. 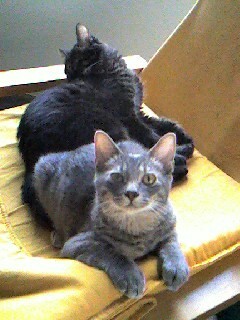 However, he attracts attention of me because he is the spitting image of the deceased cat, Baron. The front one is the deceased cat, and the back one is Chihuahua. They look exactly like each other, but Devi is different in character from timid and quiet Baron. The new face is active like a kitty and all self-assertive. So far, we completely separate their habitation spaces in our house and haven’t brought one into contact with the other because of a bit of a problem Devi has. I’ll tell you what the problems is and how we take action later on the blog. Azalea, Tutuji in Japanese, is popular in Japan and planted in gardens and alongside the street. It usually reaches full bloom from late April to early May in Tokyo. After cherry blossoms, the next amusement for flower-loving Tokyoties is the plant. 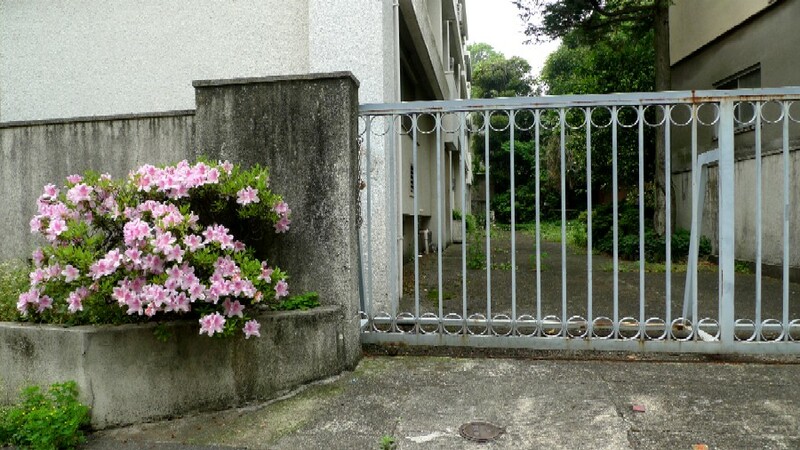 Among many beautiful Azaleas I see every year, I concern about the abandoned one in the picture the most. 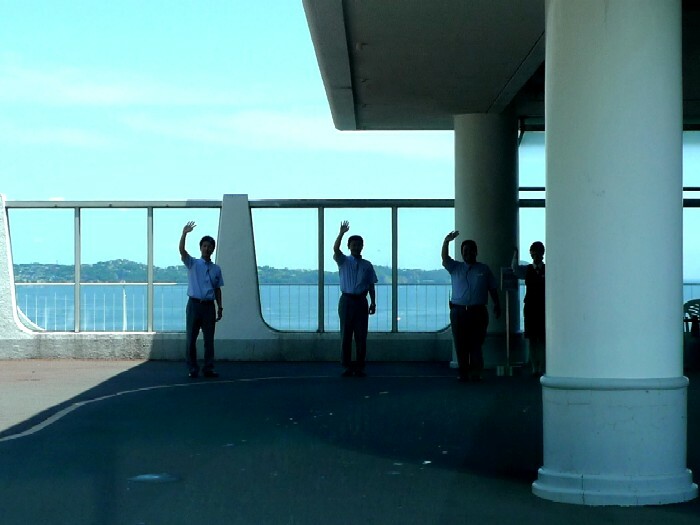 The nearby building had been used for a corporate dormitory for a long time until it was sold 7 or 8 years ago. Its fence and garden was playground for the children of the neighborhood, and I used to run on and jump down from the fence. 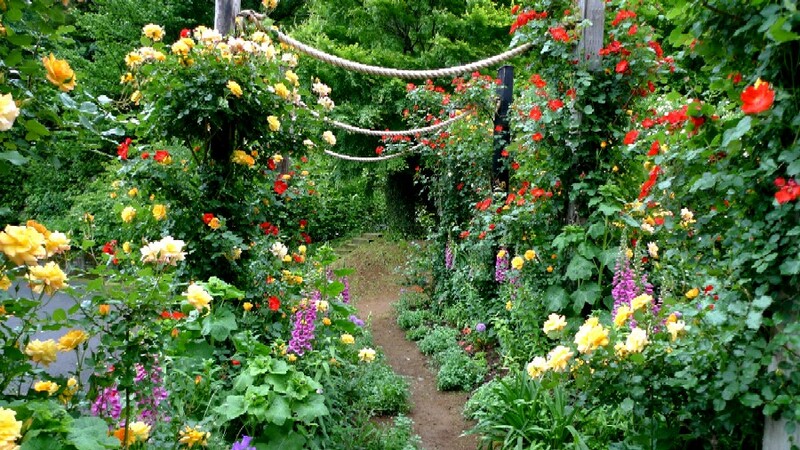 At that time, there were many azaleas, and we used to pick the flowers and consumed nectar from them. Although nobody takes care of the only surviving one, it blooms cheerfully at this time of year. One of the pleasures of the Golden Week holidays was this event. La Folle Journée est un festival de musique classique. Oops, excusez-moi! It’s originally a French annual classical music festival founded in 1995, aimed at the popularization of classical music, in Nantes. Throughout the festival period, multiple concerts are held simultaneously in a variety of venues from morning till night. Each concerts is approximately 45 or 60 minutes long and low in cost. 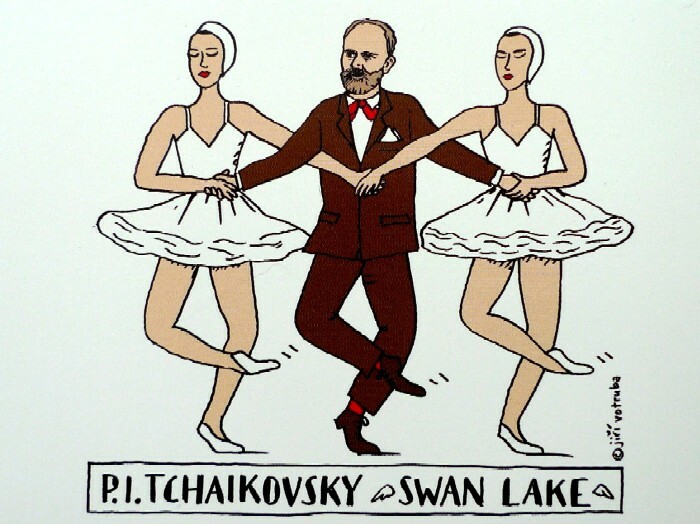 Each year focuses on a theme, initially on composers such as Mozart and Beethoven. 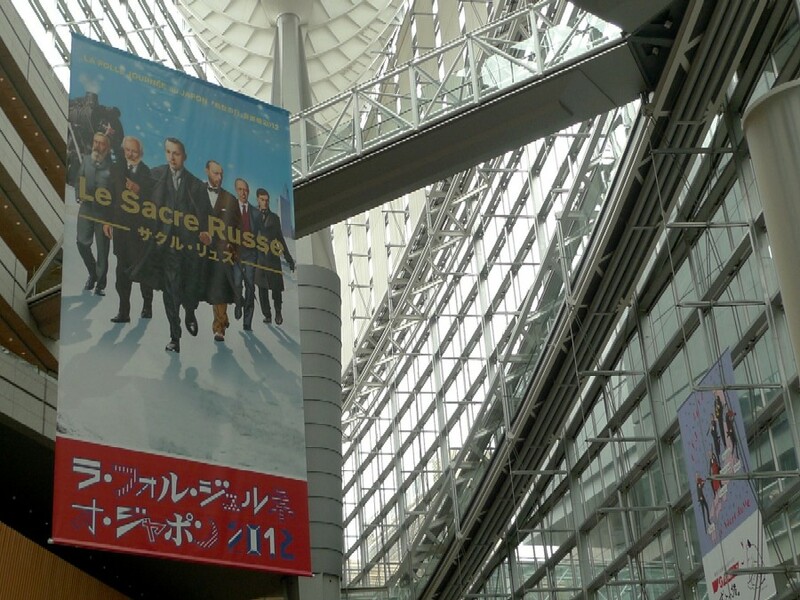 Based on the format of it, La Folle Journée has been brought to many other parts of the world, and since 2005 La Folle Journée au Japon has held in the Tokyo International Forum this time of the year. 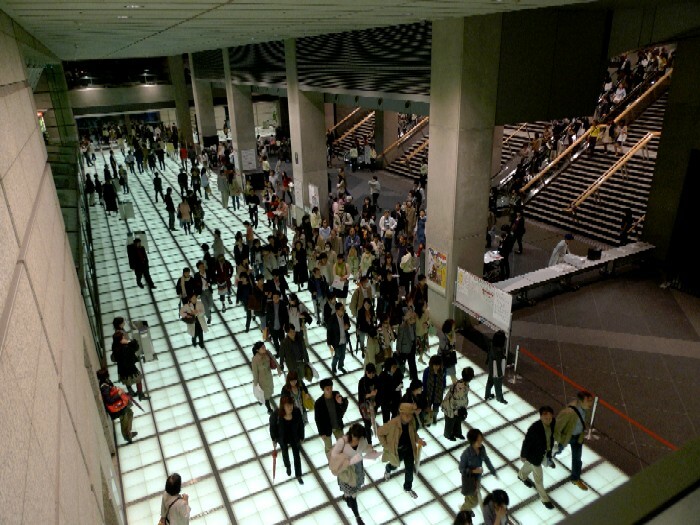 During the festival, 300 or more concerts (the tickets are between 1,500 – 3,500 yen) and related programs are held. 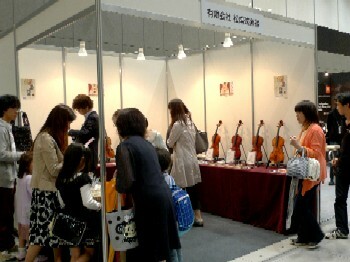 As a casual fan of classical music, I have participated in the event since 2005 except for the last few years. 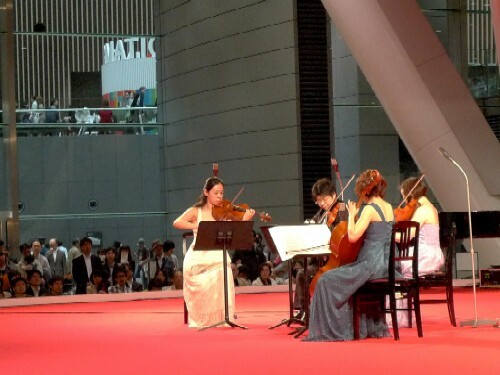 There was a stage for free events, booths of musical instrument makers, and public recording of Internet station specializing in classical music at the site. 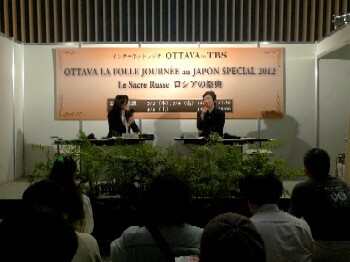 La Folle Journée Japon 2012 was held May 3rd to May 5th under the theme of “Le Sacre Russe,” the music of Russia. When I tried to get tickets just several days earlier, those to the most concerts were already sold out, but we could drop in on three of them on the first day. I enjoyed all of them, and I was tremendously-impressed with the Capella de Saint-Pétersbourg. The mixed chorus was established as a Russian Church choir that historically uses nothing other than voices. When singing devotional songs by Rachmaninov and Sviridov, the thickness of their voices was more than I could imagine. The chorus powerfully resonated with the body of Kinakinw seated in the back row of a hall. I had goose bumps; just amazing! I have CDs of Gregorian Chant, which is also unaccompanied one, so I expected something like, but that was a very different. 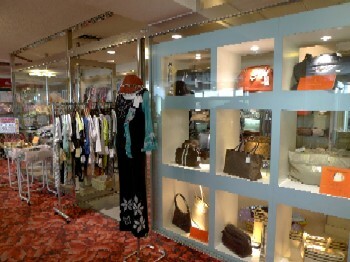 The event has a festive and excited atmosphere. 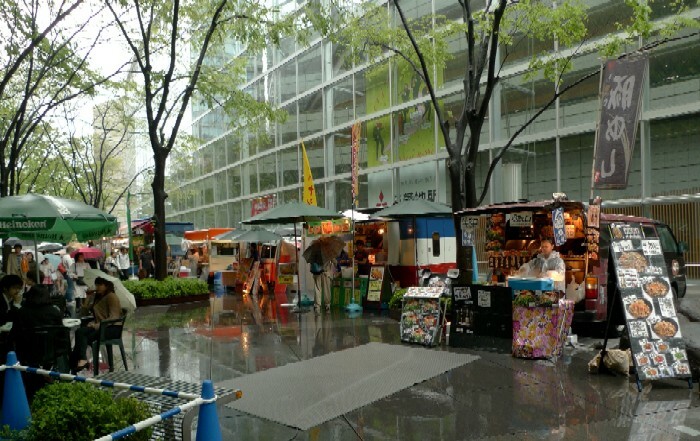 Though it was unfortunately raining, many visitors, including us, gathered in the open space, where the other stage for free events and food stalls stranded, and spent their time between intervals of concerts as they please. Some groups brought elaborate lunch boxes, and the others had a drinking party. 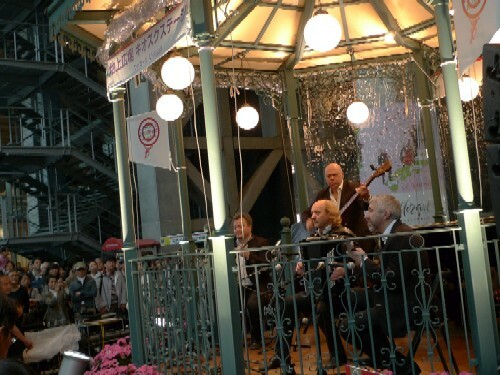 The festival has expanded to other cities in Japan: Niigata, Kanazawa, Biwa-ko, and Tosu. Why don’t you set off for the one of near you next year? I had a lot of fun, and then before I know it, the holiday's over. Japan is in midst of the Golden Week holidays, a week between April 29th and May 5th, in which a lot of people return to their hometown or go on trips. 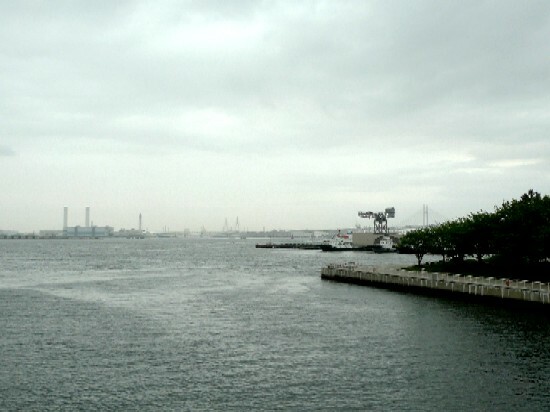 I don’t travel during this period, but instead, I usually spend my free days hanging around in the Greater Tokyo Area. 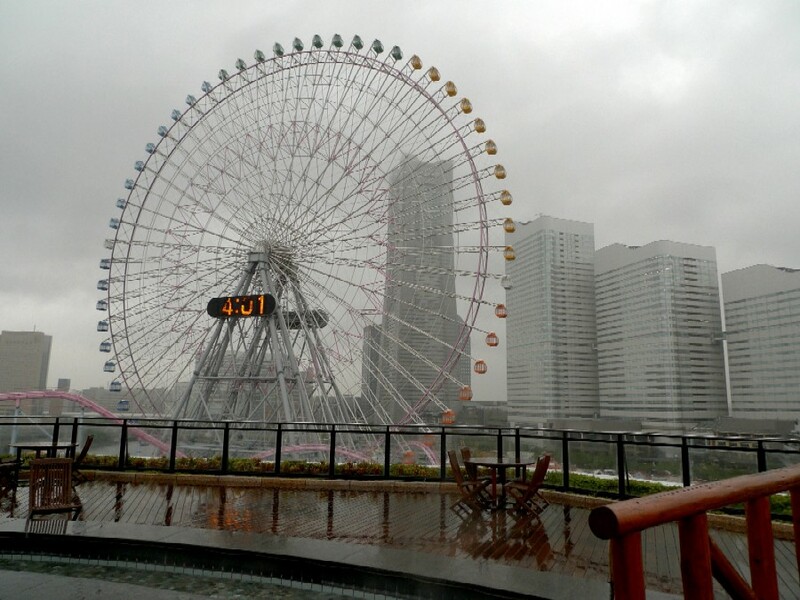 We went to a day spa, Manyo-no-yu spa, in Yokohama yesterday though it was unfortunately raining. 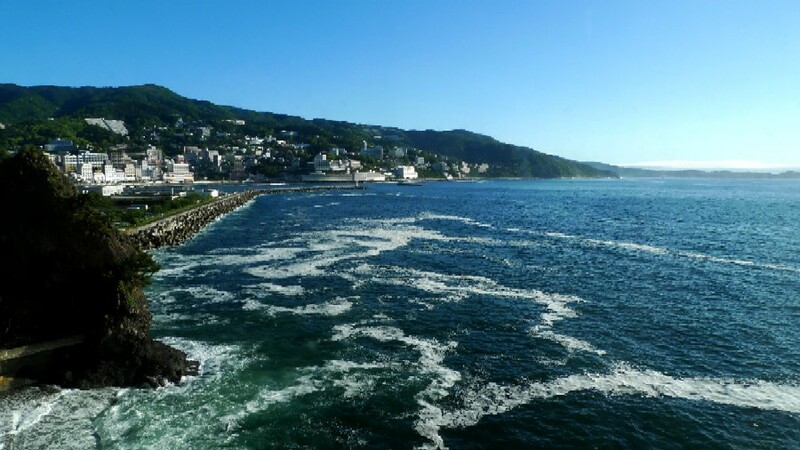 This is said the spa provides hot spring water directly brought from Yogawara and Atami (the famous hot springs near Yokohama), but the water in its bathtubs has lost traits of original natural hot spring water. I would rather call it chlorine water. However, I prefer it among several spas in the waterfront areas for the gorgeous view from outside bathtubs and all the equipment and facilities for all ages and diverse base. 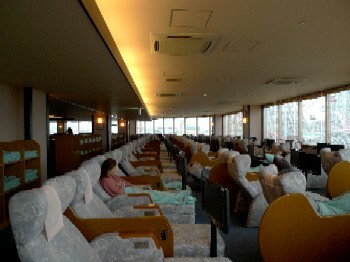 There are large bathtubs, open-air baths, the rooftop foot-bath with the view (in the opening photo), saunas, family bathrooms, relaxing rooms, various facilities for relaxation and esthetic treatment, restaurants, an Internet corner, game arcade, private rooms for party, hotel facilities, and so on. Left: It’s really relaxing to watch boats came in and out of port from an open-air bath. After taking a lot of sauna and rest, we headed to the Yokohama Red Brick Warehouse, a historical building used as a complex including a shopping mall, banquet hall, and event venues, where Oktoverfest Yokohama has been held during the Golden Week. 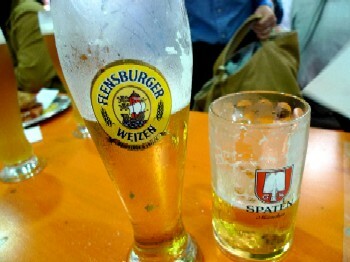 Oktoverfest is a beer festival held annually in Munich, which is one of famous events in Germany. 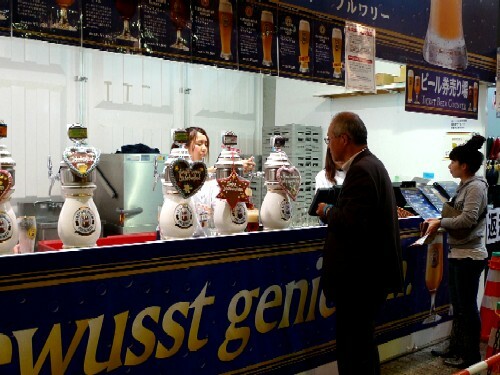 In recent years, an Oktoverfest style beer fest that gathered brewers in Munich and Japan has been held around Japan. 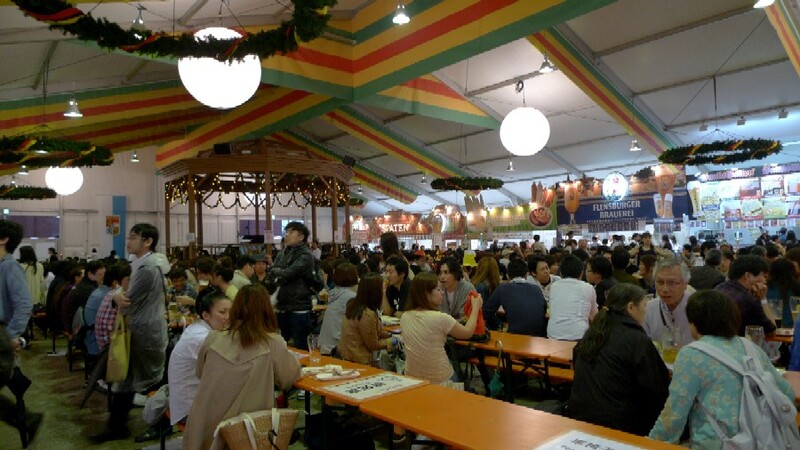 Visitors can enjoy various beers and German foods. 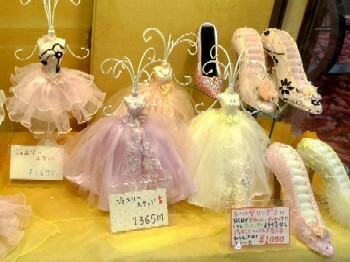 It’s the 10th in the series in Yokohama, and I think it’s popular among Yokohamans. There were a great many people in hard rain. 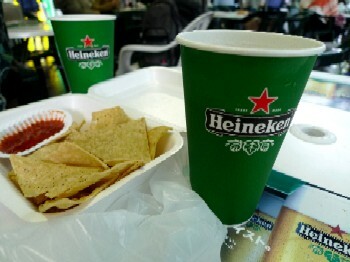 We wavered between many beer stalls. A TV reported the fest. 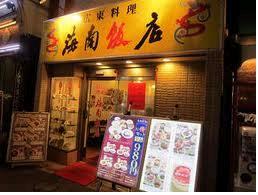 The venue was so crowded that we gave up having German dinner and moved to the Yokohama China town. 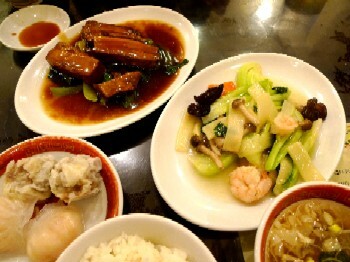 I switched drink from beer to Chinese wine and had a quick meal before we went back.